It greatly enhances traceability and collaboration between JIRA and documents. Use DocMiner to create JIRA issues from within the documents directly and relate them to any text paragraph or image. DocMiner guarantees the traceability between JIRA and the requirements (or any other issue type) in the documents, automatically opens the right version of the document and scrolls to the requirement from within JIRA. It also can compare documents snapshots, show the differences between them in a synchronized way, see how the changes impact on your current JIRA issues and import these issues (requirements) from the older versions to the newer if you want to consolidate all your requirements spread among several document versions into a single major requirement document version. Bored in a useless meeting? Don't worry, DocMiner works in the go, therefore you can use your smartphone to capture requirements from documents and assign them to developers and track the progress on JIRA from the document itself in your smartphone, from everywhere and at any time. DocMiner provides a lot of contextual information to developers when they open the issue on JIRA as it is able to provide bi-directional traceability from documents to JIRA issue and vice-versa. Hence, furthermore traceabilty it also improves collaboration and is the perfect companion for the document analysis, review, development and testing stages. If you are using Atlassian Confluence or whatever Wiiki tool as a distributed document editor (Wiki) to collaborate in the content creation phase you have to take an snapshot of your requirements by exporting them from into a PDF file, create a version on a document repository (like Subversion) to track changes between those snapshots (snapshot1, snapshot2,...). If you are using MS SharePoint, DocMiner provides built-in document browser. All versions of MS Office Word, Excel and PowerPoint, among many other formats like ODF from OpenOffice. The whole of the application is hosted on the DocMiner Server and embedded in JIRA through the plug-in. Hence, the plugin must be configured on JIRA to point to the DocMiner Server. The plug-in only invokes the DocMiner server with few parameters about the running context (user, project and issue). The DocMiner Server provides several clients to explore document repositories (Subversion or SharePoint). Those document repositories must be registered on the DocMiner Server as well the JIRA instance. An Installation Wizard allows to input all the data required in order to configure the DocMiner server in a painless way. Once an user explores a repository and selects a document link, the DocMiner Server transforms it into the PDF format by using LibreOffice and later into the the Adobe's SWF format by using the SWFTools program and displays it on JIRA by using the built-in document viewer. A two level cache is implemented in order to transform documents only once at the server side and to store locally the document in the user device at the client side. This allows users to work with documents in a really efficient way in terms of performance and hardware and network resources saving. 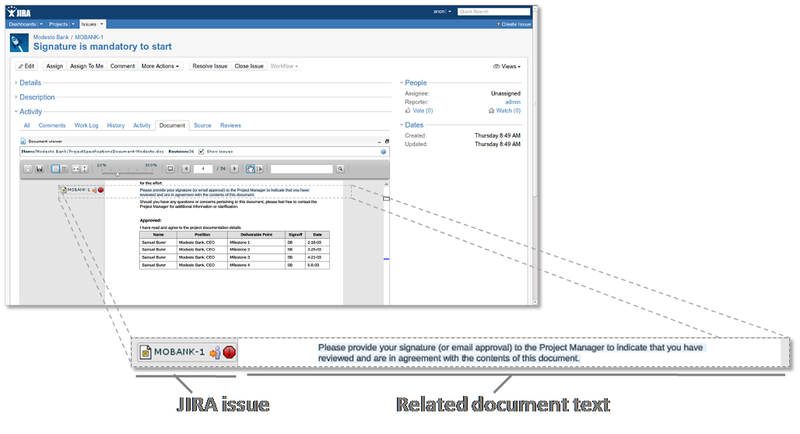 The built-in document viewer allows users to embed JIRA issues in documents and relate them to text paragraphs and images. The DocMiner Server stores the relationships between JIRA issues and text coordinates in an Apache Derby Java database in order to track those relationships every time that a document is opened from your work place or in the go.